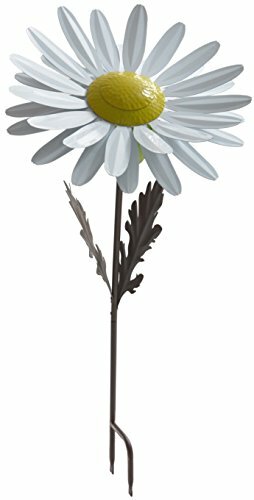 Bring a splash of color and a bit of brilliance to your yard with Desert Steel’s White Daisy Garden Torch. This beautiful metal art torch is made with durable, all-weather powder-coated steel to prevent rust and corrosion. It’s a gorgeous piece of garden décor that celebrates an iconic flower. Desert Steel’s Garden Torch is a sophisticated addition to your collection of garden ornaments. It lights up brightly under the stars using standard citronella or lamp oil. Enjoy a long-lasting 4 to 6-hour burn on each fill of the torch, which comes with a refillable canister and extra-long 10” wick. Keep insects away and create a glowing ambiance with this garden torch that assembles in minutes and stakes easily into the ground. Set it up fast when you’re entertaining or want to enjoy a nice evening in your garden. The torch comes with a snuffer/lid that stores underneath the flower. Measures 14”W x 36”H. If you have any questions about this product by Desert Steel, contact us by completing and submitting the form below. If you are looking for a specif part number, please include it with your message.